I remember back in my teens I had couple years when I was wearing lots of grey. I think if I would go back to my mam's house, I would found something from those days in my old wardrobe. Then first year in highschool was a red moment, not head to toe (thanks God), just with red details. After that I don't recall I had some particular color craving. But I know somehow in my wardrobe there have appeared more pinks over the years. Black too. I would never thought I will have. Nice post, dear. You have great style. Gorgeous outfit! 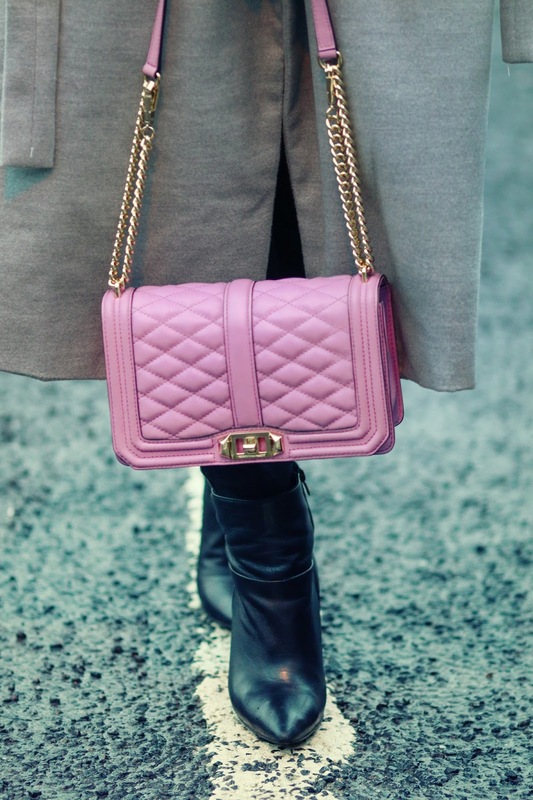 I just love the grey coat and the pop of pink from the bag! My color preferences have changed over the years too. Now I like to do a mix of color and neutrals. I love this neutral look with the pop of pink, so pretty! Gorgeous! I love your coat! It look so comfy and cozy! Love your layers and color combination. You cannot beat black and grey. Your bag adds such a fun pop. Loove your look, that pop of pink is perfect!! Great coat. Grey is my neutral tone. You look so cute. Truly loving this mix of neutral and color, just gorgeous! Stunning. I'm in love with the look and especially your bag. The coat is a statement! Love the look! I had an obsession with scarves when I was a teen! What a beautiful outfit! You look super cute and very nice !!! this coat is more than perfect!! I so love your bag, the lavender color is stunning! In love with your coat, great look! You look stunning in every single post that you publish! Love absolutely everything about this look!!!! Oh my gosh, that coat is seriously just to die for. I love the color, cut, and length! And you styled it so well. That pop of color your bag gives the look is fabulous.